Former Zimbabwe international Benjani Mwaruwari is being cast as a possible saviour for struggling Cape Town club Chippa United as they battle relegation in their debut season in South Africa's Premier Soccer League. Mwaruwari, who made his name in South Africa before embarking on a European adventure that took in successful spells in Switzerland, France and England, is expected to make his debut for Chippa United when they host top of the table Kaizer Chiefs at Cape Town's Athlone Stadium on Wednesday. It comes just a week after the signing of the 34-year-old, who last played a match just over a year ago, and is seen as a last-ditch effort by the relegation-haunted side to get themselves to safety. Mwaruwari, voted the best player in South Africa in 2001 when he emerged as a goal-scoring sensation at Jomo Cosmos, went on trial at SuperSport United before the start of the season in July. Coach Gavin Hunt enthused about his ability at the time but said the Pretoria club they could not afford Mwaruwari's salary demands. Just over six months later Mwaruwari returned to South Africa from his Bulawayo base to try out at Ajax Cape Town, who were also enthusiastic about his ability but said he was too unfit to be effective immediately and that they could not afford the time needed to get him ready. But struggling Chippa United had no hesitation in jumping in and their coach Wilfred Mugeyi signed Mwaruwari up on a short-term contract without even seeing him train. "I'm excited to have a striker like Benjani in the team," said Mugeyi, who played alongside Mwaruwari in the Zimbabwe national side. Mwaruwari left South Africa for a successful spell in Europe with Grasshoppers Zurich in Switzerland; French side AJ Auxerre, and English clubs Portsmouth, Manchester City, Sunderland and Blackburn Rovers. His new team are a far cry from the glamour arenas of Europe, playing their football at Philippi Stadium in Cape Town's shanty town. They made a fairytale rise from the third tier of South Africa football to the top flight in two seasons but have won only three times in 20 matches. Chippa have 16 points at the foot of the PSL, 27 points off the leaders Chiefs. Mwaruwari's last game was on 25 February 2012 when he came on as substitute for the final 15 minutes of Portsmouth's goalless draw with Leeds United at Fratton Park. 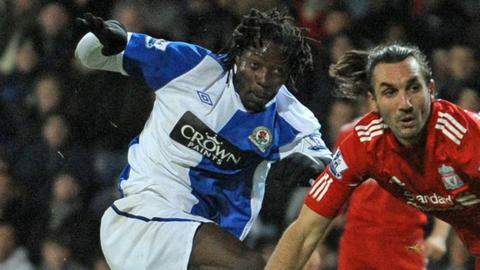 He did not play for the club after they were relegated from England's Championship.